Grevillea ‘Bush Lemons’ is a spectacular hybrid that was developed by Changers Green Nursery, Gin Gin Queensland. 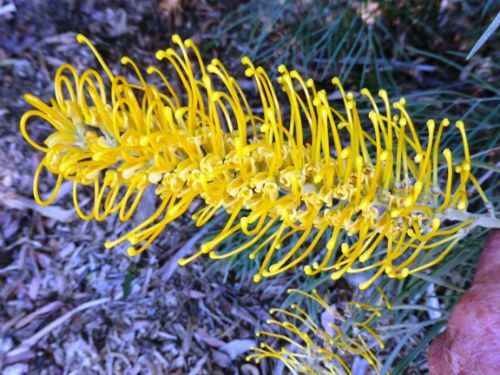 We cannot find a record of its parents but this does not detract from this long-flowering Grevillea. From its appearance, the parents would be Queensland species or hybrids. Grevillea ‘Bush Lemons’ is a medium shrub that is said to reach a height of three metres by a similar width. The leaves are grey-green and deeply divided. The large flowers are yellow and are carried throughout the year. Honeyeaters will flock to the nectar-rich blooms. Regular pruning will encourage a tidy growth habit and encourage maximum flowering. Grevillea ‘Bush Lemon’ is a beautiful shrub. The foliage provides a contrast with the large flowers. This is one of our “must have” plants. The photo was taken in a Sydney garden. In our cold climate garden we will be growing the plant in a sheltered situation preferably against a north-facing wall. We are successfully growing a number of these Queensland hybrids, including ‘Honey Gem’ and ‘Robyn Gordon’, in sheltered positions.